Chris Janssen and a good one from the Lough Oughter Complex. It is said that County Cavan alone has 365 lakes. One for every day of the year. Most of them hold pike and perch, as well as other coarse fish, like bream, rudd and roach. In addition to the lakes, or Loughs, as they are called here, there is the Erne River with its tributaries and the Shannon – Erne Waterway. 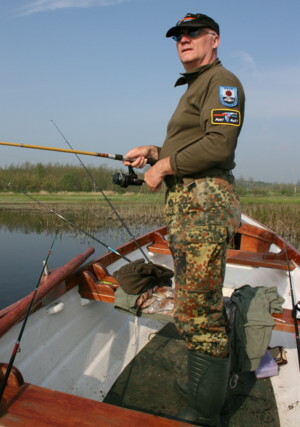 The entire region is known world wide as one of the best pike and coarse angling destinations of Europe. In recent years the fishing has suffered somewhat, due to the usual pollution modern societies produce. But there are still places where the fishing can be exceptionally good. Almost everywhere are slips to launch a boat from, angling-platforms and stiles. 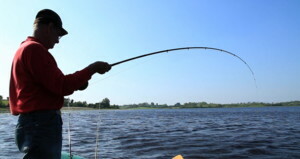 Coarse fishing is generally free in Ireland, but always ask locally for permission. Do not open gates or cross farmland without permission. Fishermen should always take care to see that the necessary permissions are obtained from the land - or fishery owners. The normal access to waters is over stiles. Do not open gates and park cars in fields. At all times respect landowners' property. Keep the waterside clean and bring your litter home. 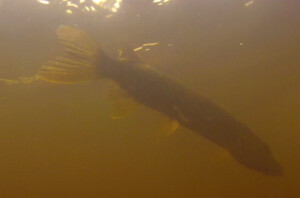 Pike, or Esox lucius, in Latin, is the largest freshwater predator of these islands. They can be found in various watercourses from small to big lakes, as well as rivers and canals. 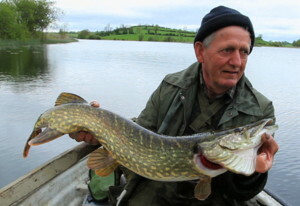 Pike are very common in Ireland, with the hotspots being the North, North East and Midlands regions. The South, South West, North West and West of Ireland are, with the odd exception, not really pikey landscapes. Upper Lough Erne, a mixture of water and land, islands, rivers, canals, swamps and bridges is a theme of such complexity that it would justify a separate full-length programme. There are so many places to fish, so many bays to explore, so many nooks to fish, so many stretches to see. Upper Lough Erne properly stretches from let’s say Carry Bridge to Crom Castle and the mouth of the Erne River and the Shannon Erne-Waterway, covering an area of about 15000 hectares. Apart from its southeastern tip all of it is in Northern Ireland. 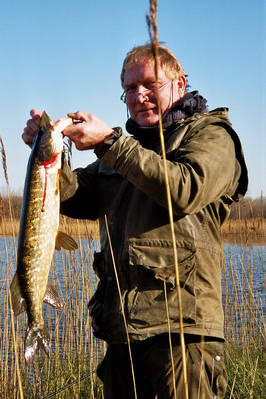 Jürgen Leinberger and his pike from Lough Oughter. Starting in the north of the Lough Oughter complex, near the little hamlet of Milltown, we like to show you Lough Ardan first. Accommodation is available right beside the lake and it is reachable via the L5524. There is parking at the road for just one car at the stile leading down to the lake. But there are two more places a bit further along the boreen where a car may be left. From here we have access to a relatively free stretch of water, particularly to the left. There are some bushes and trees along the bank, but all in all it is easy to fish. Fishing from a boat is, like so often, the better option on Ardan. We have the joy and the honour to accompany, Chris Jansson for a day’s fishing on Ardan Lake. And boy does he know his fishing. To some his methods may seem to be a bit unorthodox, but he catches fish. 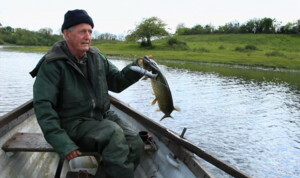 Mr. Rüdiger Trautmann and a pike on the fly on Lough Gowna. Lough Gowna, as well as practically every water system belonging to the Erne complex, is overrun by the zebra mussel. An invader from the middle east and not belonging to Ireland. Originally. So in order not to spread it any further, observe the signs and act accordingly. There is not that much for the bank angler at Cloone Shore, but at the next place he will find plenty of long shorelines with good pike water right in front of him. Rüdiger Trautmann and the loot, Lough Gowna. Dernaferst, at the Longford border, separates south Gowna from north Gowna. It is south west of Gowna Village and a straight road leads to it. There is plenty of parking here, at the lakeside amenity area, as well as boat slips on either side of the lake and a good bit of the banks can be fished here also. The most southerly point of Lough Gowna is at Dring. Again we find a spacious car park and a huge boat slip. Bank fishing is best possible to the right. In Ballybay cross the R183 and the R162, the R180 isn’t far away either. So, Ballybay is a very busy little market town. A part of Ballybay is Lough Major. When in Ballybay you can’t miss Lough Major Town Park. That is on the north side of the lake. Here it is possible to launch a boat and angling from wheelchair accessible stands is also possible. All along the northern side. Apart from roach, bream and tench there are good stocks of medium size pike. Werner Feldner and a pike in glorious sunshine. Upper Lough Erne is an amazing waterway. In some places it is just a narrow channel, in others it is five miles wide. There are 154 islands on Upper Lough Erne, or so they say. There are angling platforms at many places and fishing for perch with a small spinner can be great fun here. 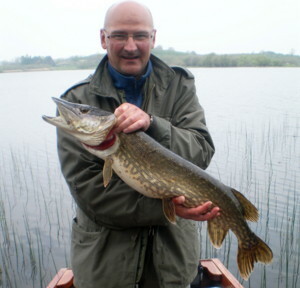 Most people come for the pike though, that's what Upper Lough Erne is famous for. The Bet, Part 5. Through the locks and a pike for Mr. Linus.